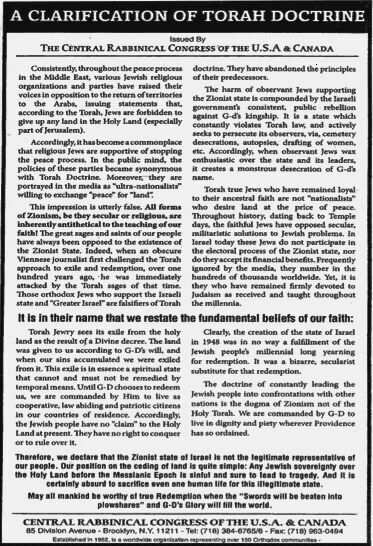 This is, I'm told, a scan of an ad placed by the CRC in the January 8th New York Times, meant to coincide with President Bush's visit to Israel. Satmar has been anti-Zionist since its inception. Many Jews died in Europe because they listened to the Satmar Rebbe and stayed in Hungary, Slovakia and Romania rather than going to Israel (or the US or Canada, for that matter). The Satmar Rebbe was later saved by Zionists. The point that makes this ad important is not Satmar's anti-Zionism. 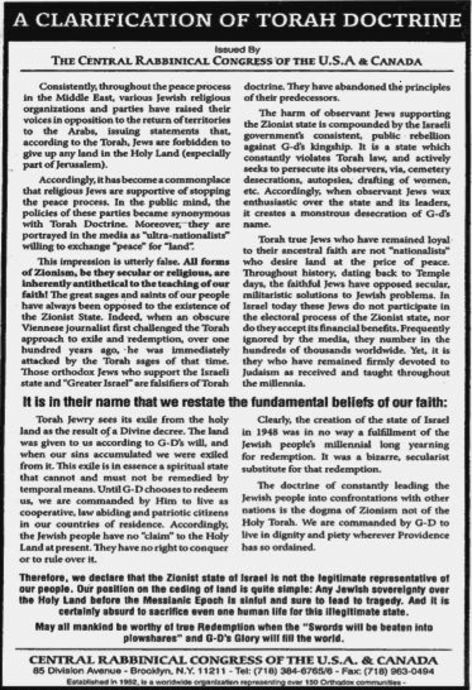 It is the claim made by Satmar that all "Torah true Jews who have remained loyal to their ancestral faith" are anti-Zionists. The CRC is, in theory, a group of rabbis. As such, they need to acknowledge all sides of the halakhic spectrum before paskining, so to speak. Satmar, like many other haredi groups, no longer bothers to do this. Anyone who disagrees with their "da'as Torah" is outside the pale. It's my way or the highway in Williamsburg. The people circulating this are calling for a boycott of Satmar produced and supervised products. I don't think that will work, but I think it's worth doing, nonetheless.